Meanwhile, the ruling Liberal Democratic Party (LDP) is looking to revise the National Defense Program Guidelines, the government's most authoritative statement of how it sees the strategic surroundings and intends to manage them. Since returning to power late last year, LDP officials have made noises about interpreting the no-war provisions of the postwar constitution – in particular Article 9, which means Japan is forsakes not just offensive military operations but the maintenance of warmaking potential – more loosely than past governments have. This has set commentators abuzz not just in Japan, but among its Asian neighbors and in the United States, its closest ally. In one sense this is much ado about very little. It's doubtful in the extreme that Hegemon is making a comeback after almost seven decades of postwar pacifism and close ties with erstwhile foe America. In strategist B. H. Liddell Hart's terms, Japan is the quintessential "conservative" power. It wants to conserve what is in the face of "acquisitive" powers' (read China's) attempts to replace the convivial U.S.-led status quo with something different, and worse from Tokyo's standpoint. Why would Tokyo upset an Asian order that benefits Japanese prosperity and security so handsomely? Conservative aims beget a strategically defensive posture designed solely to preserve the archipelago against armed attack. Parsing official statements such as Defense of Japan 2012, the defense white paper published late last year by the outgoing Democratic Party of Japan (DPJ) government, makes the defensive character of Japanese policy and high-level strategy plain. Like all governments, the LDP government wants to differentiate itself from its predecessor. Nevertheless, part of its message vis-à-vis fellow Asians must be that Japan's outlook and grand strategy will remain the same as before. Only its methods of executing that strategy will change. This is not some radical break with the past. Indeed, Narushige Michishita of the Tokyo-based National Graduate Institute for Policy Studies sums up LDP thinking thus: "What they are basically saying is, 'When a potential enemy has started attacking us, then we would start offensive operations to take out their missiles, as well as their missile bases.'" An enemy mounts a challenge, and only then will Japan reply by force. Still, this is where diplomatic dexterity is at a premium. Naval theorist Sir Julian Corbett helps explain why. Despite the lofty sentiments expressed in Article 9, a purely passive defense verges on impossible. Corbett notes that even a highly offensive war effort retains considerable defensive character. After all, a military takes the offensive in one, or a very few, places on the map. It remains on the defensive everywhere else. Forces and manpower are finite, and no force boasts overwhelming strength at all places. Similarly, even a defensive strategy like Japan's must have an offensive component. Otherwise the Self-Defense Forces will find themselves trying to ward off repeated blows while doing nothing to stop the assault. More from GPS: Can Japan, China avoid clash? No defense is perfect. The law of averages being what it is, some attacks will get through in a major missile or air barrage. Passive defense, then, represents a tough sell domestically for any government. After all, a government's foremost responsibility is to shield the populace and the homeland from aggression. The government could face a popular backlash if it were seen as doing too little in the national defense. It might even fall amid public wrath. 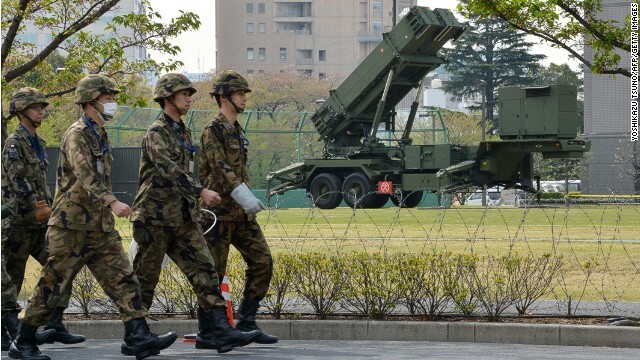 For Abe & co., it may appear better to pay the diplomatic costs of shifting Japan's operational stance to a more active defense up front, rather than await the perhaps politically fatal costs of inaction after an enemy blow strikes home. Putting it to the electorate in these blunt terms may ease the government's job of salesmanship. Hardware also complicates efforts to weave a convincing narrative about Japanese power and purposes. If few military strategies are purely defensive in nature, the same goes for weapons. Think about the F-35 Joint Strike Fighter (JSF), the stealth warplane of which Tokyo plans to procure forty-two. The JSF can be used as an interceptor, cleansing the skies of enemy warplanes. That's a defensive function ... except that by protecting Japan, it also protects U.S. forces based in Japan. And those forces represent the alliance's offensive striking arm. The JSF is also designed to penetrate enemy air defenses as a precursor to bombarding bases, missile emplacements, or troop formations. So is it offensive or defensive? The intent of the commander and his political masters – not the plane's technical specifications or the weapons it's capable of carrying – is what chiefly determines the answer to that question. The ambiguous nature of weaponry compounds the challenge of casting Japan as an intrinsically benign Asian state. And lastly, let's scope back out to the level of high politics. How will Tokyo's shift of stance influence, and be influenced by, the U.S.-Japan alliance? This is a tough one. Both the LDP government and its DPJ predecessor have intimated that they view Japan, not America, as the primary steward of Japan's defense. Defense of Japan 2012 conforms closely to Article 51 of the U.N. Charter, which affirms that nation-states may exercise an “inherent right” of self-defense ‘if an armed attack occurs.” Japan has to absorb the first punch, then it can counterpunch unless and until the Security Council marshals a response. This could inject ambiguities into alliance deliberations, however. Might Washington hesitate before riding to the rescue in times of trouble? If so, with what repercussions for Japan’s defense? Such matters are worth pondering as Prime Minister Abe and his advisers amend the National Defense Program Guidelines, draw up operational plans and doctrine, and mull future weapons procurements. In light of the gray areas illuminated here, some talking points about Japan's past and future might include: Japan has now been a liberal, democratic, pacifist state longer than it was an empire on the march. It has a long track record of abiding strictly by the language of the U.N. Charter, to the extent of foreswearing its prerogative to preempt imminent dangers. It doesn't just espouse pacifism, it lives it as much as can any sovereign state that inhabits a tough neighborhood. Abe can advance the cause by the simple expedient of keeping his views about Japanese history private. Publicly musing about whether Japan's invasion of continental Asia constituted an invasion makes Abe look obtuse at best, bellicose at worst. Stop with the self-inflicted wounds already. It will take time to develop the offensive-defensive options Tokyo is contemplating. That should give the LDP time to put its diplomatic house in order. Above all, thinking broadly about how hardware and operations are interlaced with Japanese domestic politics, foreign policy, and grand strategy should stand the Abe government in good stead. Don't worry folks, the J apanese won't do anything without the acquiescence of the right-wing thugs in Washington, but then again, maybe they should. If I were one of them, I'd deeply resent the control Washington had over my country, then again, I'm not! The English in this article is a trainwreck. Not well-written at all. There is nothing wrong with the English in the article. Do you have any problem with the English in England? We weren't informed for that many Nuclear Power built out of US radar, till we were being notified by tsuname. If you keep removing my comments that are much more intelligent than your propaganda, you will go down the trash bin as a news agency. Most people know that you are a propaganda machine. I am tired of the police state methods -I had a fill of them in the past and did not expect to see it anymore.Democracy is dead because of people like you. I fully understand, righttospeak. I had some of my posts blocked too, simply because they're not politically "correct". While we're at it, I fully agree with USMC1369 above in saying that J apan needs to become more assertive and far less subservient to Washington than it is now! Since one comment got through, the last one , I wanted to add that the article is utter nonsense and if you posted what I wrote earlier, people would have an idea what is actually going on. You sound like one of those guys that is going to snap and shoot up some place because people "didn't listen to your truth." Ja pan should apologise for its war crimes and Ja panese should do what the Germans do, soul-searching! The Germans don't shy away from admitting the atrocities of their Nazi ancestors. They also make an effort of forging peace in Europe. Why can't Ja pan do the same? Ja pan's militarism does alarm its neighbours, which had been through hell under Ja pan's imperialism during the first half of the last century. It was 68 years ago.They paid a terrible price for what they had done in WWII. On the other hand, j. von hettlingen, we Americans need to apologize for many things, too! For instance, the unwarranted bombing of the Amriya air raid shelter in Baghdad, Iraq on Feb. 13, 1991 by two American pilots if an f-117 bomber, slaughtering over 414 civilians needlessly! To this very day, no one has ever been held accountable for this dastardly act! "So is it offensive or defensive? The intent of the commander and his political masters – not the plane's technical specifications or the weapons it's capable of carrying – is what chiefly determines the answer to that question." Wow! CNN has a logical article that understands that it really isn't the weapon, it is the intent of the person with the weapon. For the record, my personal firearms are strictly defensive.